The more well known update to Google Maps was that they released a new version of Google Maps for Android, version 4.2. This new version has biking directions, a start Navigation from your Home screen, ability to share places with friends, and more. It works on devices running Android OS 1.6 or newer, and you can download the app by searching for "Google Maps" in Android Market. There is forum discussion on this announcement at Google Mobile Help. The lesser known update I spotted in another Google Mobile Help thread, where Robin from Google said that location based Tweets are now part of the Google Buzz Map Layer. 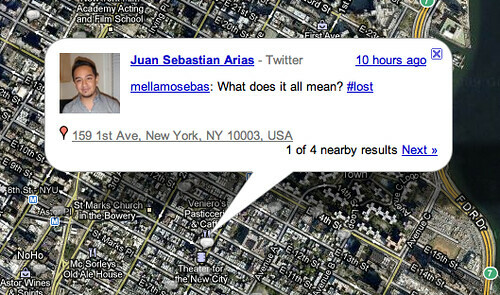 If you've added Twitter as a connected site in Google Buzz and your tweets have a location (via Twitter or other services), they'll now appear in the mobile buzz.google.com "Nearby" view and on the Buzz layer in Google Maps (both mobile and desktop). Check out one of these views to see buzz posts, tweets and more around you.